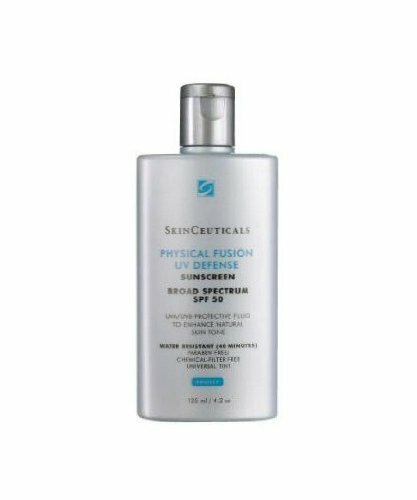 Skinceuticals UV Defense Broad Spectrum SPF 50 Sunscreen, Physical Fusion, 4.2 Fluid Ounce by SkinCeuticals at Elastic Heart. MPN: S0779000. Hurry! Limited time offer. Offer valid only while supplies last. A groundbreaking, weightless sunscreen featuring color-infused sunscreen technology that provides a universal tint and boosts daily radiance. A groundbreaking, weightless sunscreen featuring color-infused sunscreen technology that provides a universal tint and boosts daily radiance. Physical fusion uv defense SPF 50 offers the photoprotection of trusted broad-spectrum, physical filters, zinc oxide (z-cote) and titanium dioxide, and is enhanced by artemia salina, a plankton extract, to increase the skin’s defenses and resistance to uv and heat stress. The unique ‘shake then apply’ action assures even distribution of active ingredients in this silky sheer fluid that dries quickly and leaves no residue.